I am particularly concerned about a sweeping statement made by one of the most vocal activists in tobacco control, Professor Stanton Glantz of the University of California at San Francisco. He asserts completely incorrectly and irresponsibly that a new study shows long-term vaping risk could equate to half the risk of smoking. This is a grotesque exaggeration. A moderately interesting paper came out in April 2016. It’s a graph and it looks scientific, but does it mean what he says it means? These effects are, frankly, bigger than I expected. Given than heart and vascular disease and non-cancer lung disease cause over half the smoking-induced deaths, e-cigarettes could be half as dangerous as conventional cigarettes even if they cause no cancer. Look carefully. This is an extreme and unqualified claim about the long-term impact on chronic vascular disease. But the study itself is about short-term acute changes in vascular function. The distinction is extremely important, as we shall see, but ignored in Professor Glantz’s claim. Why this matters. They can’t both be right. If the Royal College of Physicians is right, then Professor Glantz is exaggerating vaping risk by at least 10 times and probably a lot more (or, to put it differently, downplaying the risk of smoking by at least 10 times and probably a lot more). Claim and counter-claims like this have the effect and possibly the intent of creating confusion. This applies both to the UK where only 15% of the public accurately believe that electronic cigarettes are a lot less harmful than smoking (ASH) and in the United States where 47% said vaping was not healthier than smoking conventional cigarettes (Reuters/Ipsos). These radically false perceptions of relative risk amount to a protection of the cigarette trade and encouragement of smoking by removing or diminishing the of the most important advantages of vaping. If tobacco control activists are causing this deliberately or negligently then they have a lot to answer for. In conclusion, coffee exerts an acute unfavourable effect on the endothelial function in healthy adults, lasting for at least 1 h after intake. This effect might be attributed to caffeine, given that decaffeinated coffee was not associated with any change in the endothelial performance. What a shame that the study didn’t add a group of coffee drinkers to compare the magnitude of the observed effects. This may even have provided usefully reassuring contextual information, given we do not live in mortal dread of coffee or exercise. Conclusion: similar effects are observable after exercise and coffee drinking – neither of which is a cause of vascular disease or a reason for concern. So it is simply not possible to draw conclusions about any disease risk from these measurements. Although the hemodynamic effects of nicotine intake could potentially have implications for risk of CVD (USDHHS 2010), the results from the study by Murray and colleagues (1996) and from other studies (Joseph et al. 1996; Tzivoni et al. 1998) suggest that combustion compounds in tobacco smoke, such as carbon monoxide and nitrogen oxides, are the primary contributors to increased cardiovascular risk. Perhaps because the authors know there are products of combustion in cigarette smoke but these are not present in e-cigarette vapour, they are reluctant to attribute a disease risk to their findings. Instead, they go no further than calling for more research. 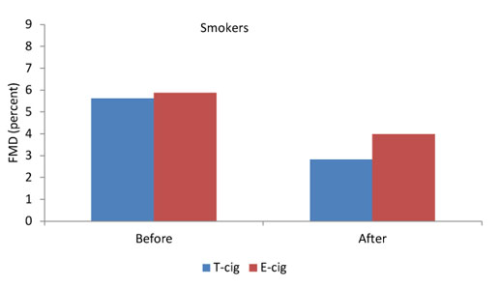 Future studies are warranted to clarify the chronic vascular effects of E-cigarette smoking. To which they should really add “if any” for completeness. Conclusion: Professor Glantz has ignored what we do know about the causes of cardiovascular disease in smoking and failed to acknowledge that these combustion products are not found in e-cigarette vapour. Professor Glantz’s claim goes further than mere attribution of cause and effect and asserts these bodily changes would result in the same magnitude of vascular disease impact for e-cigarettes as the entire vascular disease impact of smoking (and those include harms arising from CO exposure and several other cardiotoxic agents not found in e-cigarettes). The authors of the study, of course, do not make this leap – not least as they don’t even claim there is necessarily a disease risk at all, let alone assume that they can predict its magnitude. This reasoning here is completely unfounded. Conclusion: Professor Glantz has made a quantified claim based on nothing at all. The hyperbole doesn’t end with assuming cause and effect (2 above) and assuming the magnitude of the impact on cardiovascular disease is the same as for smoking (3 above)… Professor Glantz’s statement implies that these markers and bodily changes will also cause respiratory harms equivalent to the burden of COPD arising from smoking (i.e. the “non-cancer lung disease” mentioned in his conclusion) without explaining how these measured markers are related to COPD and why the magnitude of the impact would be the same. Of course, the authors of the study don’t say anything like that and he doesn’t make a case either. Conclusion: it is harmful and unethical to use a study like this to claim the entire COPD risk from smoking may also arise from vaping (a completely baseless claim) – what if a COPD sufferer carried on smoking as a result? Ultrafine particles trigger inflammatory processes that lead to heart and lung disease and can trigger heart attacks. The expediency of blaming ultrafine particles. Particulate matter (‘tar’) in cigarette smoke is implicated in smoking-related disease. So naming ‘ultrafine particles’ as the problem with e-cigarettes allows for casual linking of e-cigarettes to the harms of smoking (though by word association, rather than by science). But here is the point: the ‘tar’ particles in cigarette smoke are very different chemically and physically to the liquid ‘particles’ that make up e-cigarette aerosol. Science-by-heroic-analogy simply cannot be applied in this case. The physics (eg. phase, viscosity, temperature) and chemistry (e.g. toxicity, reactivity) of the particles matter as much or more than particle size alone. See Scientific sleight of hand: constructing concern about ‘particulates’ from e-cigarettes for my efforts to dispute Professor Glantz’s theories on this seemingly indestructible zombie argument. The effect of E-cigarette smoking on inflammatory markers may be explained by several potential mechanisms that warrant investigation in future studies. Nicotine is a pro-oxidant compound that may contribute to these alterations. Alternatively, additives and flavors may also elicit harmful effects on the inflammatory status. Finally, the inhalation of vapor may induce a cellular ROS [reactive oxygen species] increase that is sufficient to induce a lipid peroxidation reaction leading, in turn, to an increase in circulating inflammation markers. Conclusion: where did the argument about ultrafine particles come from? Not from the study. But nicotine is a more realistic explanation. The authors don’t say anything about ultrafine particles, but they do mention nicotine – see emphasis above. Nicotine delivery is the common characteristic of e-cigarette use and cigarettes – and both smokers and vapers are trying to obtain an equivalent hit, and therefore we might expect nicotine exposure to be roughly similar. It follows that any effects on the body arising from nicotine exposure are likely to be similar. So if we are looking for a common explanation for the similar findings for smoking and vaping being similar, nicotine exposure is the obvious place to start, given nothing else is remotely similar, and we know stimulants like caffeine have an effect (1 above). It is the other things in cigarette smoke that do the damage (possibly interacting with nicotine). Nicotine has acute effects, but it is not the major cause of the main diseases of smoking. Conclusion: nicotine may be causing these observations, but evidence from other patterns of nicotine use do not suggest this in itself will be manifest as a serious disease risk from e-cigarettes. If we could conclude these short-term acute effects are a result of nicotine exposure, there would be little grounds for concern. The alarming assertion that “e-cigarettes could be half as dangerous as conventional cigarettes” is not even remotely supported by this study (or by anything else). The claim is not made by the authors of the study, who say that chronic effects are unknown and require further research. It is quite possible that the disease risks implied by these markers are approximately zero, as for coffee. If nicotine is the agent in e-cigarette vapour causing the measured changes, we have little reason for concern given what is known about nicotine delivered without tobacco smoke. Professor Glantz’s claim is a wildly irresponsible statement with potentially harmful consequences if it influences the behaviour of smokers, vapers or regulators. I’m seeing ever stronger parallels between the behaviour of the tobacco industry 30-40 years ago and the reckless propaganda that pours from tobacco control activists today. There is a strong logical and ethical equivalence between the tobacco industry of the past denying the risks of smoking and the tobacco control activists of today exaggerating the risks of vaping. Both approaches, if they work, mislead the public about risk and have the effect of protecting cigarette sales, increasing smoking, and treating smokers’ health and welfare as mere collateral damage in the pursuit of some other goal. I just realized, being off by a factor of 80,000 times or so seems to be an Anti goal. They also warned nonsmokers repeatedly that the formaldehyde concentration in secondary tobacco smoke (roughly .007 ppm in an avg smoking restaurant setting) was deadly but at the same time scientists and the US Government rushed to reassure us that the 87,000 times more concentrated formaldehyde in baby shampoo (610 ppm) was perfectly safe to rub all over our babies! Assuming those smokers smoke an average of 15 cigarettes a day for those 15 years, that would be a total of over 80,000 cigarettes. Meanwhile, a nonsmoker visiting a modern and well-ventilated Free Choice (i.e. “smoking-allowed”) restaurant every night for dinner for 15 years would be inhaling the rough equivalent of having “smoked” somewhere between 8 and 80 cigarettes at most. So why has Glantz spent the last 30 years screaming to the world that those 8 to 80 cigarette inhalations are the moral equivalent of the Bubonic Plague … while now saying that doses that are 1,000 to 10,000 times greater have “nearly” no negative effect? A foolish consistency may be the hobgoblin of small minds, but a total inconsistency seems to be the hobgoblin of Antismokers and Antivapers. P.S. Worth also noting that any wackoid claims about “secondhand vaping” would involve doses, at most, of between 1/10th and 1/100th those of actual cigarette exposures, i.e. likely less than ONE cigarette in 15 years of dinnering at a vape-friendly restaurant. Which would then leave Glantz in the position of warning about a “danger” that is 80,000 times less than the “danger” he has here declared to be of little concern. Yeah. Well, half of what TC says is totally wrong and the other half is some kind of disguised fallacy, accompanied by one fact just to throw you, and a grant application. The long-term smoking studies I’ve seen all say something like “Smokers who quit before age [30 / 35] experience [no measurable loss of expected lifespan / a minuscule loss of lifespan]” [delete as applicable]. I think it was Doll’s biggie that started that trend. As an ‘unimpeachable source’, apparently, he must not be criticised. So it seems clear, Michael, that the odd 10,000 cigarettes or three has little or no effect on average, as you suggest. As long as it’s before you’re 30 or 35 of course, as that is what has been measured (and measured at length). However – strictly from the scientific viewpoint – even a few after 40 could kill you. It hasn’t been measured – so the opportunity is there. For a study. Right, sign me up for the California Lie Factory and show me where I can get my first $1 million for a study on how smoking 3 cigarettes after the age of 40 could be fatal; or how just a whiff of one, after 50, could do you in. Do they not realise, that with all this bumf, they are creating an audit trail, the width of an 8-lane highway? It will get very noisy at UCSF. Roberto, you make a good point. If you look at the outline of my 2003 breakdown of the “Types of Antismokers” at https://www.sott.net/article/128768-Recognising+Anti-Smoking+Types I think you will see something interesting. The Antismoking community was 100% behind Glantz and his distortions dealing with secondary smoke during the Helena period. All nine “types” accepted Helena as a true miracle for differing but common reasons. The last category, “The Innocents,” is highly mixed at this point but leaning toward the Glantzians since they’ve known and respected them for so long. It’s that category that vapers have to appeal to. In order to make that appeal effective, you need to discredit and expose the lies upon which the Glantzians have always based their appeal. But in order to do that effectively you cannot ignore their lies of the past since the lies about vaping are simply an outgrowth and extension of that established pattern, using the same tricks and techniques aimed at a new target. Without that background you’re trying to present a picture of these people as having changed… when in reality they haven’t. Read over those categories. If you have a copy of Brains or can borrow one, read the full fifty pages examining them. Think about what approaches need to be taken to eat into the less entrenched and less fanatical members of those first three categories and think about how the largest and potentially most powerful group, the Innocents, can best be made to see what the Antivapers are, why they are that way, and why their studies and conclusions can’t be trusted. I brushed the surface of that approach in the “Of Vapors And Vapers” chapter of TobakkoNacht (See an excerpt under the “Book Selections” tab at http://bit.ly/TobakkoNacht ) but you need to do it more widely and strongly, tying their present lies to their long-established pattern of behavior. If you succeed in doing that … you’ll have won. Michael, I fully agree with your arguments. I’ve read “Dissecting anti-smokers’ brains” and I am reading Tobakko Nacht”. There is another important difference between 2007 and today: it is far far harder for the “Glantzians” today to argue the case against e-cigarettes simply because those who vape are avoiding the health hazards that affect those who smoke cigarettes. This provides for the “Vapians” a clear, simple, evidence based and powerful message that didn’t exist in 2007 and that turns the well funded dogmatic Glantzian universe on its head. Of course, to smear vaping the Glantzians have followed the same deceptive methodological pattern they mastered on the second and third hand smoke issues (they did similar tricks to get snus banned in the EU). There is a Spanish proverb that says “a can of sardines looks indestructible but piercing a small hole on it is all you need to make it rot”. It seems that e-cigs have provided the conditions to pierce that small hole that will, at the same time, improve in the long run the health of millions of smokers and cause the (deserved) discredit of Tobacco Control dogmatists and the authoritarian policies they espouse. Once the Glantzian fraud on e-cigs is exposed other frauds will be. Note in particular the “Strengths of this Study” near the end: Unlike most antismoking studies our data and methodology was fully open for examination and verification. That was a rather odd basis since the only “already known” material was the Glantz study that the BMJ had published a year earlier and which our study soundly refuted. You can read the entire story about it in an article from The American Council on Science and Health site at: http://www.icyte.com/saved/www.acsh.org/517035?key=d70211c7cf734b02a49183473f94c8e215711bbe if you like. Unfortunately it seems to have been long accepted that the antismoking community has pretty much complete control over what the medical journals and the media will accept. Since Antivapers are pretty much all just Antismokers wearing new clothing, it’s likely that vapers’ own efforts will largely meet the same fate. 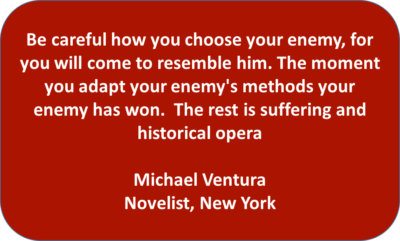 Michael, I’m aware of your impressive rebuttal to Glantz’s “Helena Miracle” piece. However, you and Kuneman wrote this study in 2007. Things may be different now, mainly because of the endorsement of vaping by some well established medical institutions: the Royal College of Physicians and Public Health England. Nothing of the sort was on the scene in 2007. You do not mention where did Glantz make these sweeping statements, in his blog? in an interview? (I assume it was not an article). Your rebuttal of Glantz’s fallacies and misreadings is spot on, but have you considered talking to other professionally qualified vaping advocates to write and submit for publication a formal collective rebuttal in a scientific journal? I am aware that getting a fair revision in Public Health journals may be very hard, as their peer reviewing process is rotten to the core (which allows Glantz and others to publish industrial amounts of junk science that would be dismissed in sciences whose peer reviewing is not so damaged). I heard once a radio interview in which Glantz vilifies vaping on the basis of an article he published in The Lancet on a meta-analysis on the effects of vaping on smoking quit rates. Glantz’s piece was a test case of junk science: he just bumped together statistically unrelated studies (thus violating the most basic guideline for the epidemiological usage of meta-analysis). While you yourself, Carl Phillips, Robert West,Peter Hajek and various other knowledgeable real experts publicly criticized this junk, either in internet blogs or in the comments section of Glantz’s piece, no formal rebuttal article was written. In my opinion this is important, since scientists in general (as well as laymen, including GP’s, politicians and the media) are not aware of the degree of intellectual dishonesty prevailing in Public Health, so they assume (as they would assume for reported results in other science domains) that a published peer reviewed article from The Lancet has met a minimal standard quality. It is important to argue forcefully in the same professional journals that the Glantz’s rants (rime not intended) DOES NOT meet even minimal standard criteria. The lack of such formal rebuttal implies that Glantz’s rubbish remains for the broad public largely unchallenged. It is time to expose this intellectual trickster in the academic arena where he moves. Hi Roberto, the article above points to Professor Glantz’s blog on the study. Also, The Lancet Respiratory Medicine did publish a formal rebuttal: Hajek P, McRobbie H, Bullen C, E-cigarettes and smoking cessation, Lancet Respiratory Medicine, 25 April 2016. [link]. However, when a journal publishes junk, it develops its own giant conflict of interest for the simple reason that the editor doesn’t want to look totally stupid. So the space for rebuttal is limited, the editors force critics to tone down their criticism, and the original author is given plenty of space to provide a specious last word. Professor Glantz continues to promote this worthless meta-analysis everywhere. His own peer group should be puting an end to that. I was unaware of the rebuttal by Hajek, Robbie and Bullen. I know that journals restrict the material and scope of critical comments on articles they published, especially if the author is an established “authority”. However, if the criticism is solid and well grounded then it merits being pursued through an independent article that is not just a comment. I believe that Hajek, Robbie and Bullen (or yourself) should have done this. This is common practice in all disciplines. The peer group of Glantz will not stop his persistent usage of that flawed mata-analysis (or of other bits of junk he has authored). What would stop Glantz advocacy based on junk science is a barrage of critical articles every time he indulges in factual and methodological flaws. Glantz and similar Public Health “authorities” have survived long enough without being subjected to any form of scientific accountability. This has to end. 1. Wait, what? They started out by making non-smokers smoke cigarettes? Isn’t this rather counterintuitive behavior for tobacco controllers? 2. Do these people understand that “one cigarette” and “one e-cigarette” are not interchangeable units of consumption? Please tell me they understand that. Nate, any chance you could get the “Study Protocol” for the study where they made folks smoke cigarettes? It’d be interesting to see if they gave the folks “no-risk cigarettes” to smoke! If we could get that secret formula from Glantz et al. and sell it to Big Tobacco we could make BILLIONS!!! Grab it quick before it’s erased! 1. You have to give the tobacco controllers one thing: they have made an art form out of protecting and promoting the thing they claim they want to eradicate. 2. If you found yourself working in an industry in which a person like Stan Glantz is regarded as a credible, world-leading scientist, wouldn’t that cause you to start asking yourself some unpleasant questions? This guy is practically a cartoon character. I am at a loss to understand how he can be taken seriously by anyone. Stan’s $6.6M figure is for 2014. In 2015, he got almost $7.2M. Can you provide a source? I’d prefer statements made here to be backed up…! I used the NIH Research Portfolio Online Reporting Tools ( https://report.nih.gov) and entered “Stanton Glantz” in the search function for year 2015. This search retuned 8 results matching the search criteria, which total $7.17M. Glantz is pants! But he is dangerous. Why has nobody in authority in public health exposed him? Where are the whistle-blowers from his world? Shame on Glantz and shame on those who provide him with the means to carry on his nasty campaigns! The $6.6M figure noted by Chris surprises even me though. I’ve long assumed that his “Professorship of Medicine” whatever was simply window dressing in recognition of millions he’d pulled in for the university and to encourage more millions that might not normally go to a simple mechanical engineer, but I had no idea that the millions might mount up toward the triple digits over the years. There’s a lot of money in it, Michael. Or as the old Californian said, “There’s gold in them thar hills”. S. Glantz receives $6.6 million annually in traceable funding (ref: B. Rodu’s site). Professor Glantz, who is not a physician and who teaches a non-medical subect (Tobacco Control) at the UCSF School of Medicine, is doing the equivalent of saying “If you’re in a burning building, but the San Francisco fog is present outside, stay in the burning building.” I note that I heard him say in a radio interview, when asked how much of his funding comes from Big Pharma, that he has never received “a dime from pharmaceutical companies.” Yet public records show massive grants to his department funding his studies, which would not at all be restricted to paying for materials. Salaries would be included, and the grant writer would receive some of the money from the University. Note the question was about funding, not bribes. In a word, Glantz lied. If you are making comments about funding or competing interests, I would be grateful if you showed a source. Professor Glantz is well funded by the National Institutes of Health and FDA. For example, see: Improved Models to Inform Tobacco Product Regulation (TCORS). But that is not pharma money. If he says he doesn’t have pharma funding, I believe him – at least until someone can show a convincing case to the contrary. Professor Glantz has never shown much enthusiasm for pharmaceutical smoking cessation treatments as far as I am aware. Superb analysis as ever, Clive. Worth noting that Stanton has previously modelled the population level benefit/risk such that vaping is net-negative if it is (from memory) 25% the harm of smoking. Seems to me he’s trying to anchor here at 50% (which is wildly and obviously silly), so he can “concede” 25% at a later point. We assigned unitless health “costs” for each final state on a scale of 0 to 100. Population health “costs” were compared with the base case (status quo) assuming e-cigarette use health “costs” from 1% to 50% as dangerous as conventional cigarette use health costs. Fancy that! A model already prepared to plug the new number into. In general there is way too much ‘ policy based evidence making’ these days.